BEIRUT, April 8 (Reuters) - At least 18 civilians have been killed in a Palestinian refugee camp on the outskirts of Damascus since the Islamic State group attacked it last week, Amnesty International said on Wednesday. The 18 were killed by sniper fire or aerial bombardment in the Yarmouk camp, and included a 12-year-old girl and a humanitarian worker, the rights group said, citing local activists. It warned that thousands more people remained at risk from fighting in the area and from Syrian air force strikes. Islamic State, which controls large areas of northern Syria and Iraq, last week took control of most of the besieged camp, just a few kilometers from President Bashar al-Assad's palace. The group was still in control of most of Yarmouk on Wednesday, said Rami Abdulrahman, head of the Syrian Observatory for Human Rights. The monitoring group says the Syrian military has intensified its bombardment in response. 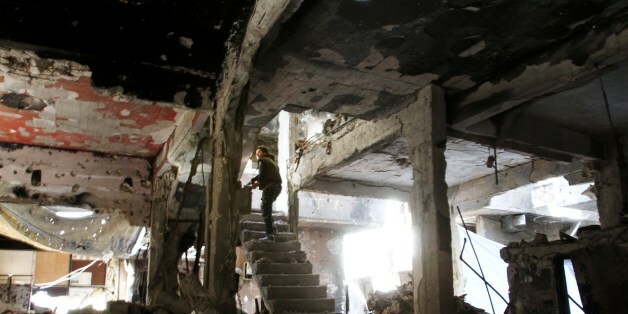 Since taking control of most the camp on April 1, Islamic State fighters have clashed with rival armed factions based in Yarmouk including Aknaf Beit al-Maqdis, an anti-Assad militia of Palestinians and Syrians. The camp was already a battleground before the Islamic State siege. Food, water and medical aid have long been scarce for Yarmouk's estimated 18,000 inhabitants. "After enduring a crippling two-year-long government-imposed siege, now they are pinned down by sniper fire fearing for their lives as shelling and aerial attacks escalate," said Hassiba Hadj Sahraoui, Amnesty International's deputy Middle East and North Africa director. Only a handful of people have managed to escape since Islamic State attacked, according to the United Nations. The United Nations Security Council said on Monday it would look into how to help those under siege. Pierre Krahenbuhl, head of the U.N. Relief and Works Agency (UNRWA) has called for civilians to be evacuated. "Things in Yarmouk are reaching a point of severe inhumanity," UNWRA spokesman Chris Gunness said, warning that 3,500 children were in danger. "What we clearly want to avoid is a slaughter of the innocents because potentially what we are seeing is children put in harm's way as this merciless conflict continues."